And why do you wear those pink vests? Legal Observers, or Human Rights Monitors as they are sometimes called, have become a common sight at large scale protest events throughout the western world over the past decade or so and the chances are you have seem MALS Legal Observers in the pink hi-vis vests at a protest in Melbourne. Working in organised teams in hi-visibility vests, arm-bands or special caps and armed with clipboards and cameras, Legal Observers are becoming more common at protests as governments increase police powers, restrict protest activity and roll-back basic democratic freedoms in ways once unimaginable. The independent citizen monitoring or police at protests has a long history. In the United States the Black Panthers was perhaps the earliest group to deploy community legal observers to patrol and monitor the policing of Black communities in the late 1960’s and early 1970’s. In Australia, priests were called upon to act as observers and to provide a moral deterrence to police violence.during the large anti-Vietnam War moratorium marches. The Legal Observer Team formed in Melbourne for the S11 protests against the World Economic Forum were the first in Australia since that time. Observer teams have been used for many decades in places like Northern Ireland, where independent civilian groups formed ongoing human rights monitoring teams with the aim of documenting and deterring the brutality of the occupying military and police force. 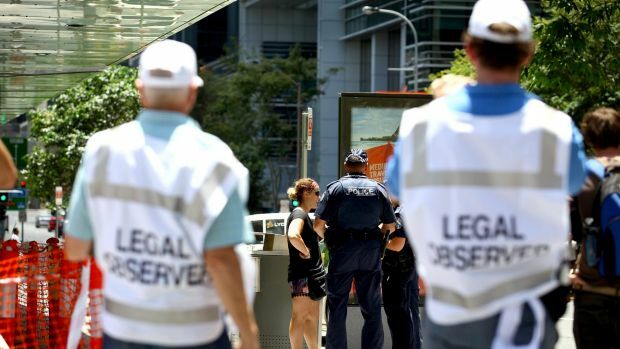 More recently, legal observer teams were deployed at many large scale anti-globalisation demonstrations around the world – including the protests held in Seattle, Prague, Quebec, Washington, London, Torronto, Melbourne, Sydney and Brisbane. Internationally, citizen initiated, third party observer and monitoring projects are becoming more common. Amnesty International US recently fielded Legal Observers during protests in Ferguson, Missouri and sent teams of Human Rights Observers to the Dakota Access #NoDAPL Pipeline protests. The US National Lawyers Guild (NLG) routinely field Legal Observers throughout the United States. The goal of a Legal Observer Team is to ensure and enhance the political ‘space’ within which people protest. The highly visible presence of independent citizens helps to ensure that abuses of the civil, legal or human rights of citizens at the hands of police do not go unnoticed. The presence of Legal Observers should reduce the probability of police abuses or may assist in ensuring that arrests are carried out in a less violent way. Legal Observers therefore act as a viable form of deterrence of police violence. 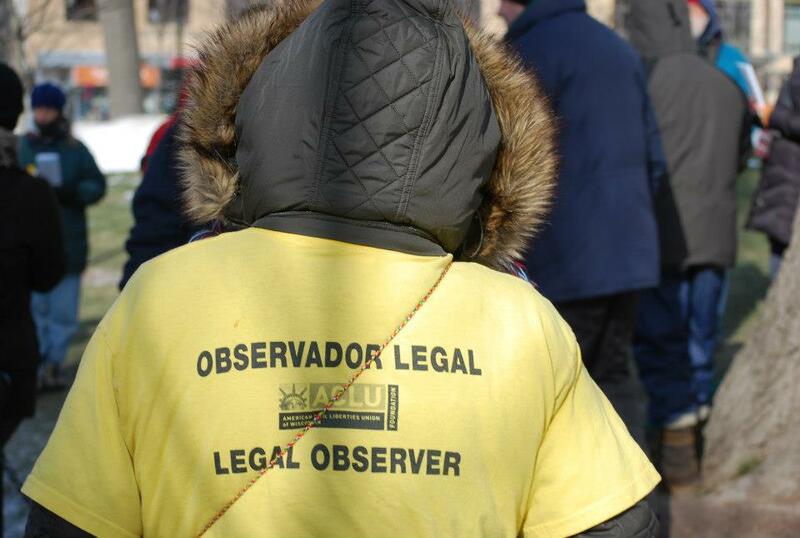 Legal Observers often act for as the eyes and ears of a larger legal team — to observe and record incidents and the activities of law enforcement in relation to the demonstrators. This includes documenting any arrest, use of force, intimidating display of force, denial of access to public spaces like parks and footpaths, and any other behavior on the part of police that appears to restrict activist’s ability to express their political views. This documentation is done in a thorough and professional manner, so that lawyers representing arrestees or bringing an action against the police will be able to objectively evaluate the lawfulness of police conduct. Information gathered by Legal Observers has contributed to defending and advancing the rights of activists in many scenarios. Documentation has also been critical for detailed analysis and reporting on the police actions at protests. See some of those Legal Observer reports see our Resources page here. Legal Observers don’t give legal, tactical, or political advice, negotiate with the police for demonstrators, or speak to the media or public on behalf of the protest. We will however speak publicly about police action and about human rights abuses we witness and report afterwards. Legal Observers are trained not to interfere in arrests but instead take in as much information as possible. As public order policing becomes increasingly paramilitary –by deploying violence and force against groups of unarmed people –so the need for independent Legal Observing and counter-surveillance of police actions becomes more acute. Legal (or third-party) Observer Teams aim to provide a level of independent and impartial scrutiny at community protests and political events that serves to deter police from using violence against citizens. The deterrence effect of a Legal Observer Team can include the simple effect of being observed, the threat of future civil legal sanctions against police, the reinforcement of existing police accountability mechanisms or the possible application of domestic civil rights or international human rights mechanisms. Legal Observers act as on-the-ground witness’s so that our notes, our photos and out testimony can be used in follow up court action or for complaints against police. Being a third-party (ie. not one one of the protesters) means that our testimony has more credibility in a court. Legal Observers wear vests or some form of clear visible identification in order to stand out and to ensure that the police and public notice us. Being visible and being seen is crucial. Legal Observers will often stand so that police will notice our presence. Significantly, third-party observation or ‘presence’ can also serve to reduce the level of fear experienced by activists when faced with violent or coercive police responses. The presence of Legal Observers can be reassuring for activists when isolated or fearful of what the police may do. This reassurance function is less tangible but and important impact of a legal observer presence. In contexts where the legislative and police response to protest is intimidation and overwhelming show of force, the presence of independent third parties dedicated to civil and political rights can be critical. Both the deterrence effect and the reduction of fear are important objectives of the Legal Observer teams. Most people are alienated from the law, by obscure legal language, and by the decisions that are made in courts and parliaments. At the same time, protestors are disproportionately targeted by the state and police authorities and disproportionately entangled in the law and criminal justice system. By providing clear legal information, assisting protestors to give statements and making complaints against police abuses, Legal Observers help people to use the law to assert their civil and political rights, and -in so doing –help give people more control over what happens to them. The deterrence impact of Legal Observers is very limited however and can never be relied upon. Horrific abuses and infringements of rights occurs despite the presence of observers. But the presence of dedicated, trained and identified observers adds to and reinforces, both practically and symbolically, the range of legal, ethical and political constraints on police behaviour which already exist. These constraints, which include international human rights covenants, public and media scrutiny and public opinion, the threat of legal sanctions and civil litigation against individual police, and current Police ethical standards, protocols and standing orders, will not prevent the police nor private agents abuse power nor will they prevent gross violations of people’s rights occurring. But Legal Observers, by being on the ground and accurately witnessing and documenting abuses, can serve to strengthen the limited effectiveness of these constraints on police behaviour. NETPOL: Network for Police Monitoring in the United Kingdom have this great guide How to Be a Legal Observer. Huffington Post ran this article Legal Observers Help Monitor Police which is worth a read too. You don’t have to be a lawyer or legally trained to be a Legal Observer but training in the relevant laws, police powers and observer skills and protocols is important. If you’d like to become a legal observer and you are based in Melbourne then keep an eye out for our next training on our training page. or join our email list.